“A rose red city, half as old as time.” Isn’t that just so romantic?? The description fits Petra perfectly. 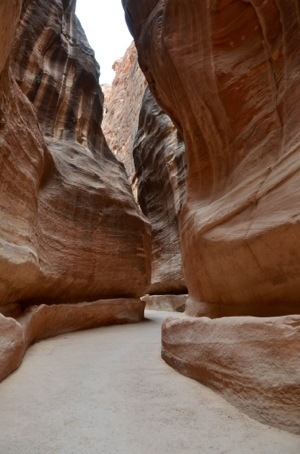 Undoubtedly the pride and joy of Jordan is Petra. 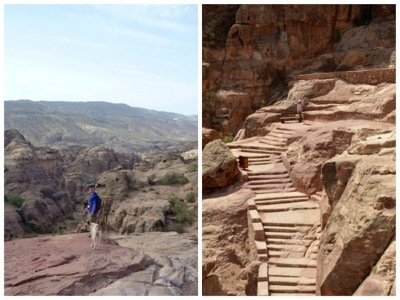 We spent 2 days hiking around Petra and it is our choice for most beautiful place in the world. 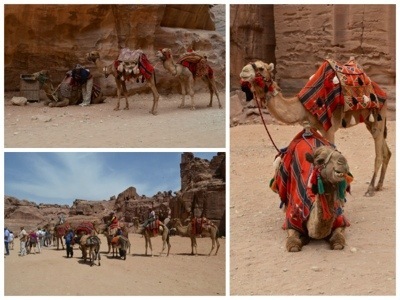 Without a doubt, Petra is one of those places you absolutely must see before you die. The combination of the natural beauty along with human craftsmanship isn’t comparable, there is nothing else like it out there. 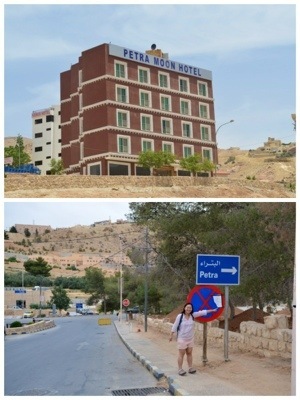 Our hotel, Petra Moon, was an easy two minute walk down the hill from the entrance of Petra. We took advantage of our proximity and got our start at 6am each morning when the site opens. 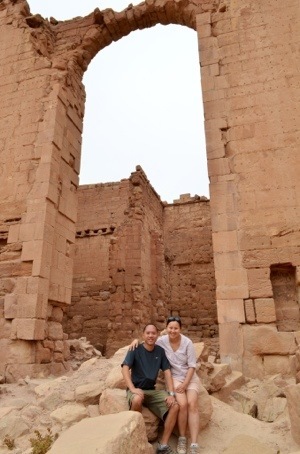 Whereas we spent half days at other world wonders (3 hours each at the Great Wall and Taj Mahal, 1 hour at Christ the Redeemer), we dedicated two days to Petra. A single day ticket for people daytripping from Israel costs 95JD, whereas a 2 day pass is 55JD. 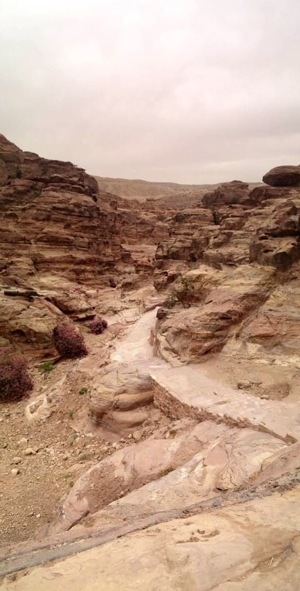 This is the way Jordan encourages tourism in their own country. By the way, similar to the Taj Mahal, nationals pay a fraction of the cost, 1JD. Booths lining the path to the entrance: Indiana Jones snack shop! 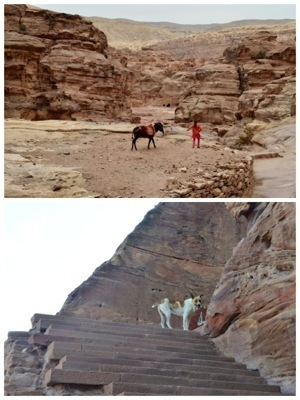 It’s about a brisk 30 minute walk to the Siq, you can see some carvings along the way. We started getting all googly eyed when we got to the Siq. Such a beautiful path! 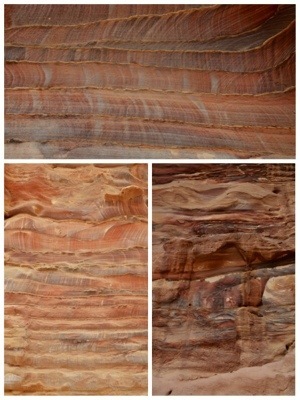 It takes maybe 10 minutes to get through the Siq if you don’t stop to take pictures. Bonus, the Siq is also wonderful because it’s shaded! 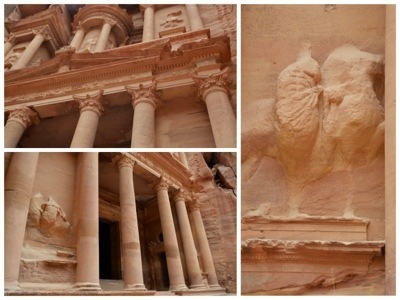 I think our most favorite part of Petra was exiting the Siq and seeing the Treasury unfold in front of us. It was incredibly magical and we were awestruck. The best part about it was that we had the entire moment to ourselves, not a soul was around. We literally just stood there and gawked at the entire thing. It was just so gorgeous. And since it was overcast, the lighting was just perfect for photography. We spent a good hour at the Treasury. You can’t go inside unfortunately, but we sat on one of the benches and just hung out. It was also fun to people watch and look at their reactions when they see Petra for the first time. 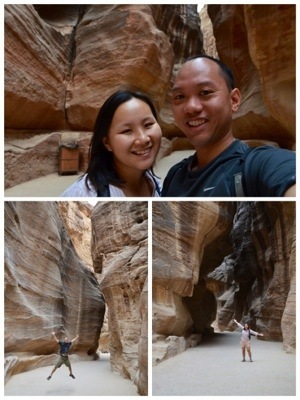 We took advantage of the overcast day and went on a 2 hour hike to the Monastery, Petra’s #2 attraction. If you’re up for it, this is a good hike to take because many other attractions are along the way. Can’t believe that arch is still intact! Brown University currently has an excavation project going on. 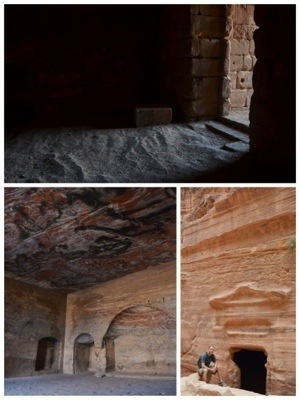 Did you know that experts say only 15-20% of Petra has been uncovered? Amazing! Generations to come will hopefully have more to look forward to. 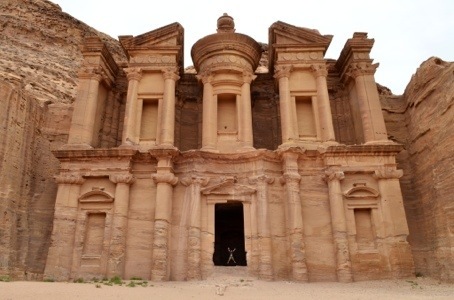 The Monastery is larger and less intricate than the Treasury. Definitely worth the hike! Even though your ticket gets you a “free” ride from the entrance to the Siq, you still have to pay “tip.” We opted to explore the entire park on foot. I read that the camels, donkeys, and horses are abused, beaten, and overworked. Jerry actually even saw a worker drop kick a camel in the head, which was so sad. At our age, it’s easy to turn down rides because we can handle the distance and heat. However, I can see that an older person or a young kid might benefit from paying for rides. 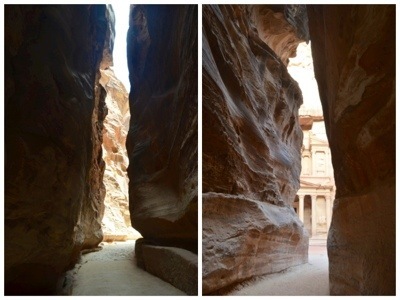 Petra is so huge that you realistically can’t explore the entire thing in one day. We had the luxury of two days, which not everyone opts for. Again we left at 6am and had the Siq/Treasury to ourselves. Day 2 was looking to be a very sunny day, so we immediately left for the hike that gives an overlook of the Treasury. 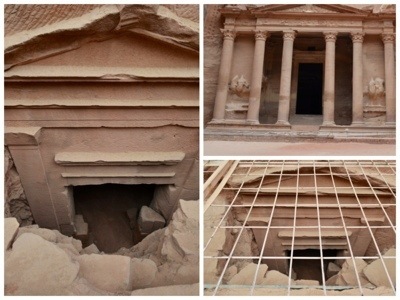 Along the way, we explored some tombs. The natural colors are so gorgeous! This dog was annoying at first because it kept following us around and sniffing our food. It was also quite dirty and so we didn’t want to pet him for obvious reasons. However throughout the hike he grew on us and we even named him Buddy. He was sort of like our hiking guide, it was endearing! In some areas the trail was not marked as well, and so Buddy would “guide” us in the right direction. Left: We are back on the ground a few meters from the Treasury. I’m pointing to where we hiked up to! Right: Up on top is a nice tent like structure, perfect to relax and rest before going back down. We opted out on seeing Petra by Night (Jeannie kept wanting to call it Paris by Night, those of you who are Vietnamese would get this joke), because we heard it was crowded and very touristy. 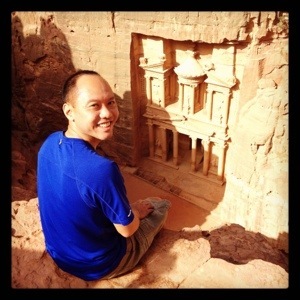 The description sounds romantic, seeing Petra in all it’s glory by candlelight/moonlight. But after watching youtube vids and reading online reviews we gathered that we’d essentially be herded with other tourists in a large group and be forced to watch a “cultural” show with music/dancing, and whatnot. Not our idea of a good time! It’s also pretty pricey and not included in the 2 day ticket. Bathrooms are really clean, well at 10am, I don’t know about 5pm, but up to date plumbing and western style. They are also a decent number of facilities throughout the park. Food is very expensive inside the park, so at dinner each evening before, we ordered a few sandwiches to go and we also picked up fruit and drinks from local markets. Of course this only works if your hotel room has a fridge. 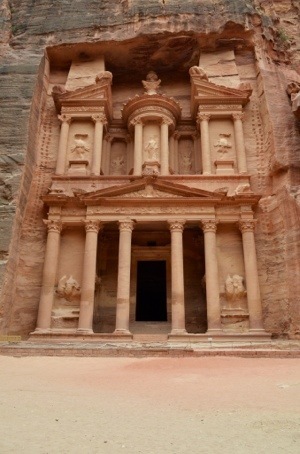 Petra is the name for the Archeological Park/site. 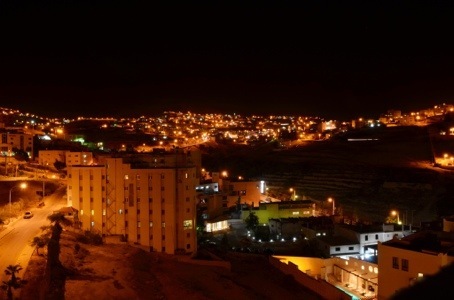 When you book accommodations and eat out, you’re actually in Wadi Mousa, the town that serves as a gateway to Petra. We thought we’d clarify this because we were initially confused as well! Definitely go for the two day ticket. The weather was perfect at 6am when we headed back to the hotel by 1-2pm or so, it was pretty uncomfortable. As we made our way back shortly after lunch, we saw folks that were barely heading out. That’s too ambitious for us! Also, the later you go, the more crowded it is, that’s when the hordes of tour buses caravan dozens of tourists at at time. There is just nothing comparable to having the Treasury to yourself, even for a few minutes! The view from our hotel. Beautiful! 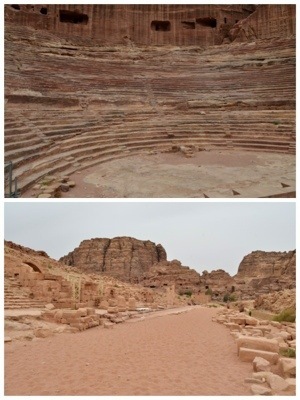 All in all, Petra was our favorite place on this trip so far. 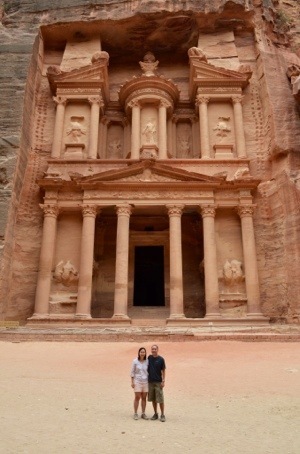 We’ve got a month to go before we fly back to SFO, so it’s safe to say we don’t think anything will top our Petra experience. So what are you waiting for? Book your ticket now! 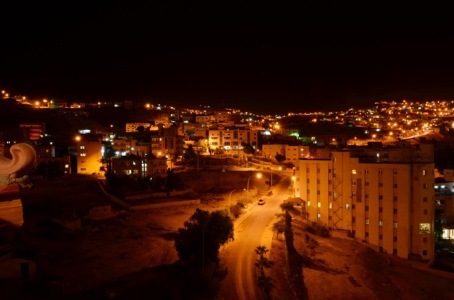 While Jordan is a very safe country at the moment, who knows what the future will bring. The region is so volatile (latest news: Syria), and so it would be a shame if Petra ever went the way of the Bamiyan Buddhas. Although I highly doubt that would happen (would be the travesties of all travesties), one can’t really predict the future. Especially for a region like the Middle East. We hope you enjoyed this post! Our next post: floating in the Dead Sea. We ❤ Jordan! 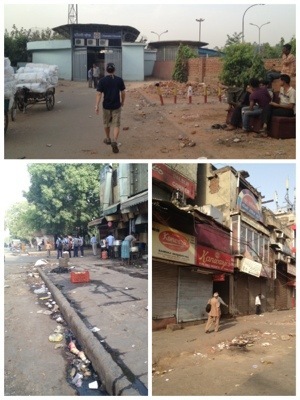 India is one of those countries where you either love it or you hate it. We had a hard time adjusting to the culture and finding the charm in India, and we were happy to be in and out in less than half a week. 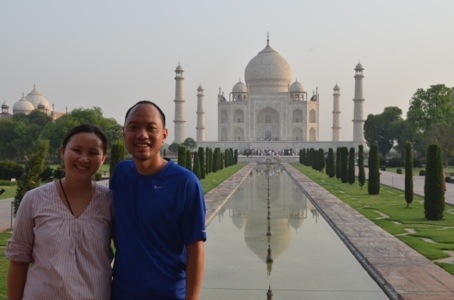 Due to flight scheduling, we only had 3 days in India and thus decided to make seeing the Taj Mahal our one and only goal. We achieved it but it certainly was a whirlwind. 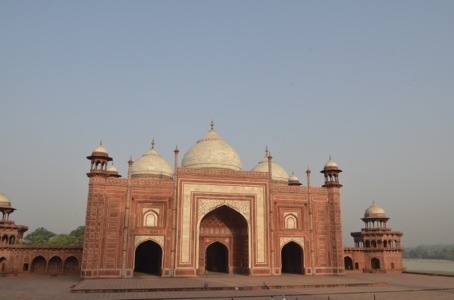 Arriving in New Delhi, our senses were overloaded with 110 degree heat at 10pm, crazy traffic, not-faint-for-the-heart driving, people and animals everywhere, homeless beggars lying around in the street, and in general, chaos. We even saw a dead body in the street a hundred yards down from our hotel. My initial thoughts were: this country is a disaster. It was quite a shock coming from the cleanliness and civility of Thailand. On top of that, I’ve never felt so unwelcome in a country due to the staring. Everyone stares at you, and especially Jeannie as a female. You get the impression that the general population has never seen an Asian person, even though India is supposedly part of Asia! It’s an extremely uncomfortable feeling and something that we almost never experienced having grown up in California. The last time Jeannie was stared at was during a cross country road trip going through Indiana. Even then it was just a curious stare from some kids. In India, it felt much more intense and very invasive. 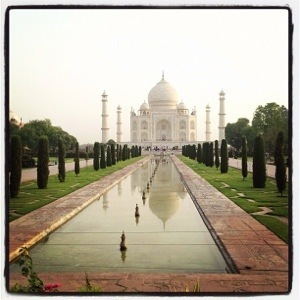 To get to the Taj, we had to first get train tickets to Agra. There’s no way to buy train tickets in advance online, so we gambled and decided to try our luck once we landed in New Delhi. 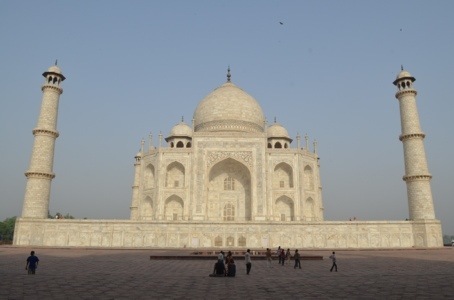 All of the hotel staff and travel agencies said that there would be no way to find next-day tickets to Agra, and we would have to hire a private driver ($100) for the 120-mile trip to Agra (which takes at least 5-7 hours driving due to inadequate roads). 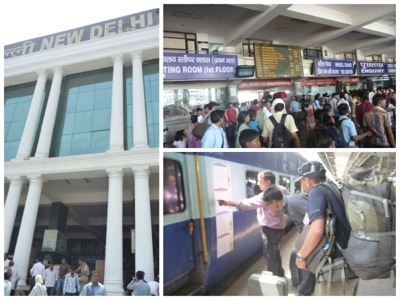 I refused to believe that, so the next morning we headed out to the New Delhi Railway Station via subway. Surprisingly, the subway is clean, efficient, and modern, with AC. Once we got to the railway station after 2 stops, we crossed over to platform 1 to find the International Tourist Bureau, where we scored same-day tickets in AC3 class using the foreign tourist quota. Most people don’t know that a small percentage of seats in all trains (usually 2 per train) is reserved for foreign tourists, but it takes a lot of effort to book these seats. In addition, we were able to buy next-day return tickets on the 8pm Shadabati express (takes about 2.5 hrs), all for $30 for the two of us. One of the subway entrances was ghetto as heck, but inside it was decent. The train station was chaos and just plain ghetto. There is limited seating so people will just lie on the ground everywhere throughout the station. Kids will pee on the train tracks. No surprises, trash everywhere as well. AC3 is a mid-class sleeper car, with 6 people per compartment section. During the day, the bottom berths fold into seats. It was a fairly decent 3.5 hour ride (we had non-annoying neighbors), and we found our way to the prepaid taxi stand for our ride to the Radisson, which is walking distance to the Taj. We’d definitely recommend the Radisson for the convenience factor. For the Taj Mahal being the bread and butter of Agra, no, India!, you’d think Agra itself wouldn’t be so run down and crappy. But it was, and we definitely were glad we didn’t stay in town. In fact we didn’t even go into town once and took all our meals at the hotel. 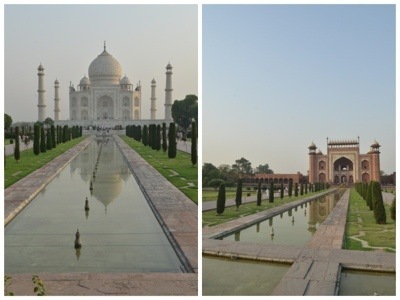 The next morning, we started walking to the Taj at 6am in order to beat the crowds, heat, and street peddlers, and to capture the building and grounds in the early morning sun. It was definitely worth it. If you go any later you’ll be bombarded with locals trying to lure you into buying overpriced souvenirs, food, and rides via animal/wheels. It’s extremely overwhelming and sometimes even dangerous. Not every tourist knows this, but your ticket (which you buy away from the gate) allows you a free ride via golf cart to the gate itself. You just have to queue outside for a moment. 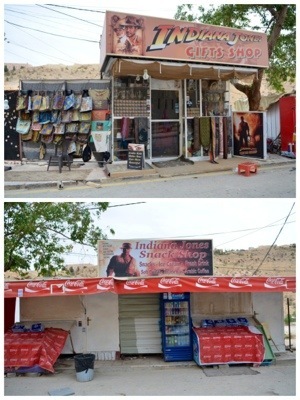 However, locals will try to trick you into going into their trucks, and pretty much pretend that it’s free. Of course the unsuspecting tourist will accept the ride, and have to pay later. We really, really, detest this kind of scamming, and it seems that the government turns a blind eye when it comes to scammers. 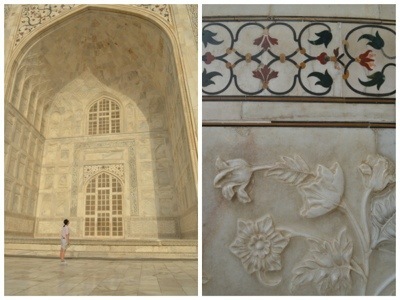 The Taj Mahal is a beautiful mausoleum situated in a large garden overlooking the river. The inside is a relatively simple crypt–it’s the outside where the beauty lies. Once the sun started heating up and the tourists started coming en masse, it was time to go…at 9:30am. Yep, we made it back in time for the hotel breakfast! We were able to score a late check out from our hotel and squatted in the lobby until 7pm. Then began our most ridiculous plan to date: 8pm train from Agra to New Delhi Railway Station, 11pm next-to-last-subway train of the night from the railway station to the airport, cumulating in our hotel picking us up at 11:30pm (our hotel offers free airport pick-up, and no one said you had to fly in to redeem it!). We really were ballsy in formulating this plan, I don’t know what we were thinking. Anything could have gone wrong and we would have been SOL. Our train could have been really really late (it actually was only 20 min late). The website could have lied about the last airport express subway train from the railway station to the airport (website said 11:30pm, our hotel in Agra told us it was 11pm). Our hotel could have forgotten to pick us up and we would have been stranded at midnight. However, luck was on our side, and we made all the connections smoothly, just 15 minutes later than we planned. We did end up catching the next to last airport express, whew! We felt like we were in an episode of The Amazing Race. So we’d probably not recommend to do what we did in terms of cutting things so close. We were successful, but boy were we stressed out for a little while. 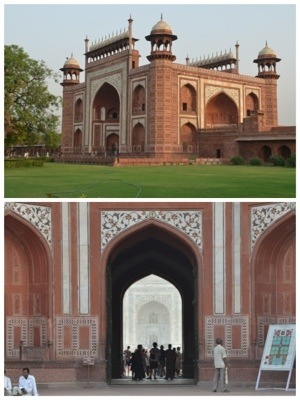 But we truly did not want to spend a second more than necessary in New Delhi or Agra. 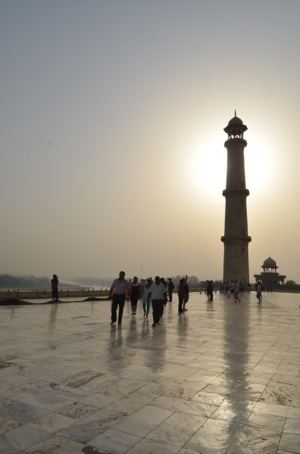 We just aren’t the kind of travelers that find fascination in the poverty, chaos and lack-of-infrastructure that seems to dominate New Delhi/Agra. Maybe other parts of India are totally different and actually civil, but we aren’t eager to find out anytime soon, if ever. 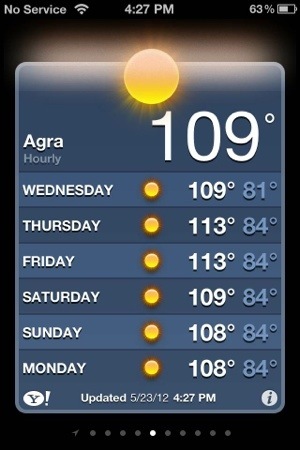 Especially when it’s 113 degrees.